I love it. Good value. The photos do not do it justice! Just gorgeous quality and the detail of the metal of Our Mother's halo is just so neat. So impressed at how beautiful this Medal of our Lady is for the inexpensive cost. I wear it everyday and will be buying another as a gift. 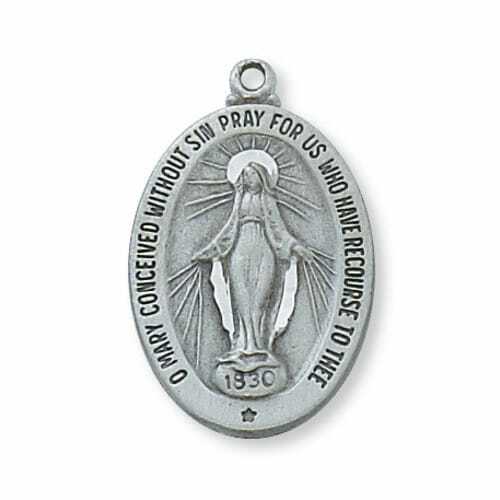 This medal is clearly engraved and the length makes it a perfect reminder to pray. Purchase was for me. I lost a pewter medal I received in grade school. Bought this as a replacement and love it. Chain length is perfect. These medals are great quality and perfect size for young children. It was a good medal for my grand daughter who loves it and wears it every day. I was very impressed by the cost and quality of this product. Thank you!